These were spotted within 5 minutes of each other, in Trastevere. It’s always a little mystery to me when I come across a blocked in doorway, with the street number still visible. And then, the Latin translates to “Guilty”. Curiouser and curiouser. Wouldn’t you love to climb these steps to enter your little home after work each day? A street lady and her dog, gradually fading and eroding, probably in reality also. This is near the fresh fruit and vegetable market. It took me a moment to realise the “olives” are , in fact, bicycles. Clients entering a hotel, in Ostiense. Maybe they are severely jet-lagged? 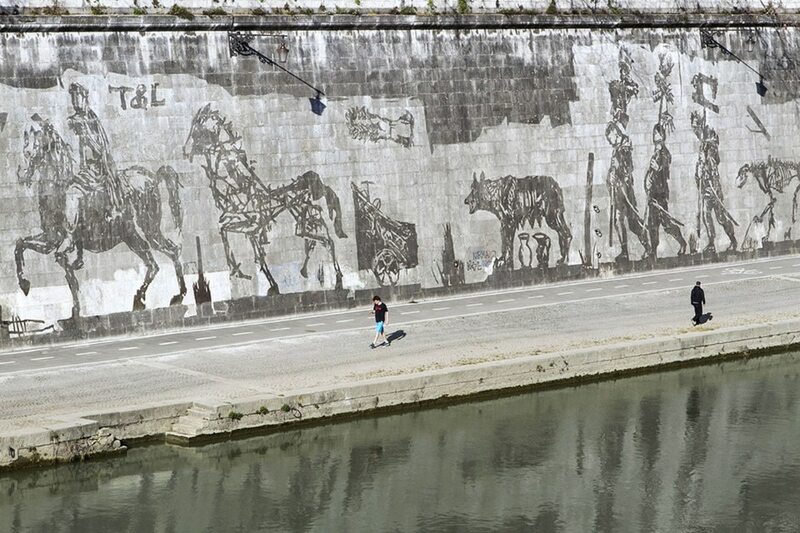 On a 500 meter stretch of the wall that runs along the Tiber River, there is an enormous mural. The walls must be at least 7 to 8 meters high, and the figures just about reach from top to bottom in places. The images were created using stencils, and high pressure hoses blasted off the muck from the walls, to leave the figures you can now see. It is best viewed from the opposite side of the river, this I can tell you from personal experience! Peter, you probably can tell me all about this fellow, found off the Via del Corso. When I first glanced at this, inside a dimly lit church, I could have sworn it was carpet. It isn’t, it’s some beautiful inlaid work. I was surprised it is not protected in some way, so many feet would have shuffled across this. This time you have to look up, to see this lovely relief. Park where you wish, outside a local bar, where they know how to make darn good caffè. Although there is a department store on this block (with a supermarket in the basement), there are plenty of goods for sale on the street stalls. I just liked this street corner, and the bright yellow car. Inside Santa Maria in Trastevere. One is for you, Marco. Who is Ernest Olkowski? Why was he right? When you go to the website Ernest Olkowski you only see a number that is counting down. If you inspect the code behind the webpage you will see that it is “the number of seconds remaining to March 8th 2024 12:33:21”, which happens to fall inside the duration of the next total solar eclipse visible in the entire North America. Evidently, when that specific moment passes, the number will disappear and there will only be one word: “EXPIRED”. Please make a note to yourself to check this site on that date, and time. Trastevere is such an interesting part of Rome in which to wander. Little side streets tempt you to see what might be down them, and the pavement is alive with people and vehicles. While admiring the colours and design of this apartment building, I noticed a little della Robbia lookalike on the corner. A reminder of the recent past, embedded in the pavement, outside another apartment building. And, a reminder of the street artist My Dog Sighs. The fellow leaning on the broom remarked that usually, there is one man working and 3 watching. Maybe the other two were having a coffee break? If we did work like this, we wouldn’t have to go to the gym! When next you walk on pavement like this, please give a thought to the hard work that goes into the maintenance. It was a lovely afternoon for a wedding. This fellow is master of all he surveys.